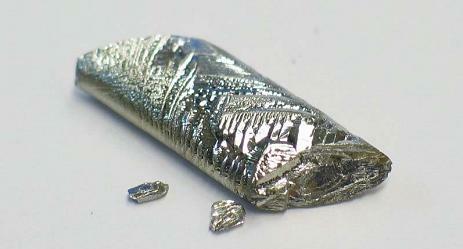 Tellurium is an extremely rare metalloid used in alloys and semiconductors. It is chemically related to sulfur and selenium, and mainly produced as a byproduct of copper. With the higher price of tellurium that persisted during 2007–09 and projected increases in demand, tellurium was increasingly viewed as a valuable byproduct. This helped stimulate exploration for gold-telluride ores, including some early stage projects in the Western United States. World demand for tellurium was estimated to have decreased in 2009. The leading use for tellurium was as a metallurgical alloying element. Tellurium was used in steel as a free-machining additive, in copper to improve machinability while not reducing conductivity, in lead to improve resistance to vibration and fatigue, in cast iron to help control the depth of chill, and in malleable iron as a carbide stabilizer. Owing to recent higher prices, many steel and nonferrous metals producers have reduced consumption and found substitutes for tellurium. Consumption in chemical, catalysts, and other uses, the next largest end-use category, declined owing to the recent increases in price. Tellurium was used as a vulcanizing agent and as an accelerator in the processing of rubber and in catalysts for synthetic fi ber production. Other applications included the use of tellurium in blasting caps and as a pigment to produce blue and brown colors in ceramics and glass. High-purity tellurium was used in alloys for electronics applications, such as thermal imaging, thermoelectric, phase-change memory, and photoelectric devices. Consumption of tellurium in these applications was estimated to have decreased in 2009 because of the global economic downturn. Mercury-cadmium-telluride was used in thermal-imaging devices to convert the raw image into a crisp picture on the screen, for infrared sensors, and for heat-seeking missiles. Domestic Production and Use: In the United States, one firm produced commercial-grade tellurium at its refinery complex in Texas, mainly from copper anode slimes but also from lead refinery skimmings, both of domestic origin. Primary and intermediate producers further refined domestic and imported commercial-grade metal and tellurium dioxide, producing tellurium and tellurium compounds in high-purity form for specialty applications. Tellurium’s major use is as an alloying additive in steel to improve machining characteristics. It is also used as a minor additive in copper alloys to improve machinability without reducing conductivity; in lead alloys to improve resistance to vibration and fatigue; in cast iron to help control the depth of chill; and in malleable iron as a carbide stabilizer. It is used in the chemical industry as a vulcanizing agent and accelerator in the processing of rubber, and as a component of catalysts for synthetic fiber production. Tellurium was increasingly used in the production of cadmium-tellurium-based solar cells. Production of bismuth-telluride thermoelectric cooling devices decreased owing to the reduced manufacturing of automobiles containing seat-cooling systems. Other uses include those in photoreceptor and thermoelectric electronic devices, other thermal cooling devices, as an ingredient in blasting caps, and as a pigment to produce various colors in glass and ceramics. Recycling: There is little or no scrap from which to extract secondary tellurium because the uses of tellurium are nearly all dissipative in nature. Currently, none is recovered in the United States, but a very small amount is recovered from scrapped selenium-tellurium photoreceptors employed in older plain paper copiers in Europe. Import Sources (2006–09): China, 49%; Canada, 17%; Belgium, 13%; Philippines, 9%; and other, 12%. Imports of unwrought tellurium and tellurium waste and scrap decreased by 18% in 2009 compared with the alltime high imports in 2008. The leading suppliers, in descending order, China, Canada, the Philippines, Russia, Belgium, Japan, and Mexico, accounted for 99% of the total imports of tellurium metal into the United States (table 5). The annual average value of imports in 2009 was $134.95 per kilogram of tellurium was high by historic standards but was lower than the alltime high of $174.21 per kilogram in 2008. In 2009, tellurium exports fell to 8 t, an 84% decrease from 50 t in 2008. The main destinations, in descending order, were Germany, China, Hong Kong, the United Kingdom, and Taiwan, and accounted for 93% of total tellurium exports. Despite lower prices for tellurium metal, the annual average value of exports of tellurium in 2009 was $148.34 per kilogram, which was higher than the 2008 value of $60.57 per kilogram but lower than the alltime high of $200.07 per kilogram in 2006. In 2009, much of the stockpiles of low-value tellurium scrap were depleted owing to increased exports of scrap in 2008 because of the higher price that year. Events, Trends, and Issues: In 2010, estimated domestic tellurium production remained the same as in 2009. Although detailed information on the world tellurium market was not available, world tellurium consumption was estimated to have increased in 2010. The price of tellurium increased in 2010 because of increased demand for solar cells. The majority of production of tellurium in Japan was used in the country’s steel industry to replace lead in steel products. World Resources: The figures shown for reserves include only tellurium contained in economic copper deposits. These estimates assume that less than one-half of the tellurium contained in unrefined copper anodes is actually recovered. With increased concern for supply of tellurium, companies are investigating other potential sources, such as gold telluride and lead-zinc ores with higher concentrations of tellurium, which are not included in estimated world resources. More than 90% of tellurium is produced from anode slimes collected from electrolytic copper refining, and the remainder is derived from skimmings at lead refineries and from flue dusts and gases generated during the smelting of bismuth, copper, and lead ores. In copper production, tellurium is recovered only from the electrolytic refining of smelted copper. Increasing use of the leaching solvent extraction-electrowinning processes for copper extraction, which does not capture tellurium, has limited the future supply of tellurium supply from certain copper deposit types. Substitutes: Several materials can replace tellurium in most of its uses, but usually with losses in production efficiency or product characteristics. Bismuth, calcium, lead, phosphorus, selenium, and sulfur can be used in place of tellurium in many free-machining steels. Several of the chemical process reactions catalyzed by tellurium can be carried out with other catalysts or by means of noncatalyzed processes. In rubber compounding, sulfur and/or selenium can act as vulcanization agents in place of tellurium. The selenides of the refractory metals can function as high-temperature, high-vacuum lubricants in place of tellurides. The selenides and sulfides of niobium and tantalum can serve as electrically conducting solid lubricants in place of tellurides of those metals. The selenium-tellurium photoreceptors used in some xerographic copiers and laser printers have been replaced by organic photoreceptors in newer machines. Amorphous silicon and copper indium diselenide are the two principal competitors to cadmium telluride in photovoltaic power cells. Apollo Solar Energy (OTC: ASOE) - Mines, refines and produces high-purity tellurium and tellurium-based compounds. Wholly owned Dashuigou mine in Sichuan Province, China. Also sources tellurium from a mine in Shimian, Majiagou, China. Tellurium refining in Chengdu, Sichuan Province. Mitsui Metal Mining and Smelting Co.
2011-06-20 - (mv) - Precious metals: Is tellurium the new gold? 2011-06-20 - (gtm) - First Solar owns a gold, silver and tellurium mine? 2010-10-18 - (mf) - First Solar to acquire 5N Plus to access tellurium? 2007-04-19 - (ri) - Byproducts part I: Is there a tellurium rush in the making?